It seems like you can't go online these days without being bombarded by location-based updates from your network. There are Foursquare check-ins on Twitter, Plancast updates in your e-mail, and Facebook Places check-ins on, you guessed it, Facebook. Location-based services are the hottest online trend of 2010, dominated by a few big names (Foursquare, Gowalla) and a multitude of startups trying to take advantage of the buzz. Users have jumped on board, jockeying to become the "mayor" of their favourite local hotspots, and using the services to find out where friends are. Companies have embraced them as well, with retailers like Starbucks offering discounts and promotions to the mayors of their retail locations. Some local entrepreneurs are taking advantage of the craze with location-based offerings of their own, and they're trying to put their name on the map (pun fully intended). One local startup is using location-based video to "rethink geography class." At the height of the recent recession, Adil Dhalla was frustrated by the constant doom and gloom in the media, and in the community. 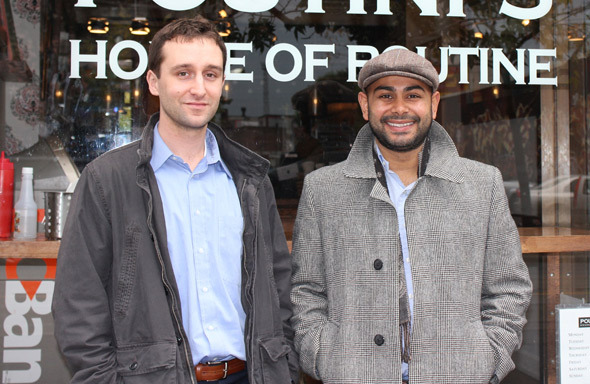 Adil was working on a very offline business - trying to export fair trade honey from Tanzania. When the recession hit he found it impossible to access enough capital to make it work. He and his friend Adam Ben-Aron started a group called Creativity Killed the Recession with the goal of bringing people together to network, support and collaborate ideas to alleviate the economic downturn. Though the recession has ended (mostly), the ideas tossed around at those meetings are still very much alive. Adil and Adam went on to found MyCityLives, an online platform that allows you to share your experiences with your city's public spaces. Or, as Adil puts it, they take you one step beyond Google Street View and into locations using crowdsourced video. MyCityLives leverages the power of video and location-based services to provide an interactive map of Toronto - you can visit the site and see how locations are highlighted with videos from people in the community. One video takes you inside Grindhouse Burger Bar - you can hear the music playing, and check out the selection behind the bar; another takes you into Nuit Blanche in the Distillery District and shows you art installations. Adil believes that we're only seeing the early potential of online video, and says niche sites like his will find a place among local communities. "Despite over 24 hours of footage uploaded to YouTube each minute, we are only at the beginning of the online video phenomena and with video enabled smart phones becoming more popular, this industry is poised to explode - meaning there will be value in niche offerings like My City Lives," he says. He also says they have no intention of taking on YouTube, because they don't serve the same purpose - his company is all about getting you acquainted with your local neighbourhoods. "You don't go to YouTube to see what a coffee shop looks like. On My City Lives you do." The focus for the MyCityLives team over the next few months is building content partnerships, adding to the site's functionality, and of course developing mobile applications. They're already using their Facebook page to run promotions with local businesses like Poutini's (the latest giveaway starts today), and they've also launched the MCL Magazine to showcase local businesses and events. Another local location-based startup was born only 12 days ago, not exactly the usual amount of time needed to build a company. It all started at the recentStartup Weekend Toronto, a local extension of an event that's been held in over 50 cities worldwide. The idea is to bring together entrepreneurial people for a weekend to build a product or company, many that continue long after the weekend ends. The winner of last weekend's event was location-based application Task Ave. Task Ave. is a solution to a simple problem - forgetting to buy milk (or other essential items you needed to grab while you were out). The application, which is launching soon, will allow users to add a task (buying milk, picking up the dry cleaning, etc) and assign it to a location. Then when you get near that physical location, for example the grocery store, up pops a reminder. The team, which includes Matt Rintoul from local design agency YouSayYeah and Satish Kanwar from digital experience agency JetCooper, presented in front of 500 startup enthusiasts at yesterday's Democamp - during the presentation they promised added functionality, including the ability to ask friends for favours (so they can buy milk for you next time they're in the area). And for any photography fans, Burstn is a recently-launched application that allows you to share photos in real-time with friends. The company, founded by local entrepreneurs Dave Senior and Josh Davey, addresses the multi-step process of sharing photos on your Smartphone. So instead of snapping a photo on your iPhone and then uploading it to Twitter/Facebook/everywhere else you live online, you can use the Burstn app and it automatically uploads to your feeds. 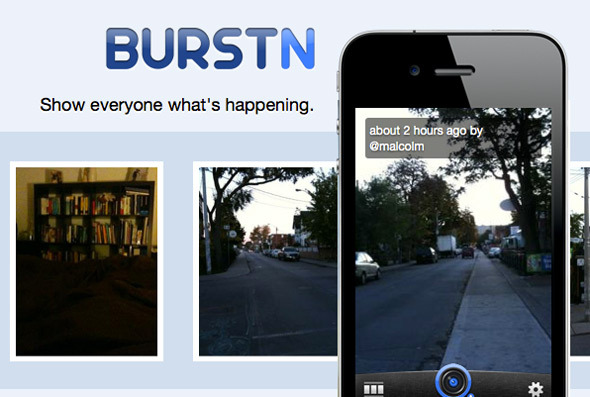 Burstn fits into the location-based bucket because every photo is tagged with the user's location - so you can actually know where your friends are when they're snapping pictures of celebrities during TIFF. Some location-based startups have been around a bit longer, including Clip Mobile, a local location-based mobile coupon platform that launched in 2009. Founder David Offierski is ramping up efforts to bring on local and international retailers, and this weekend they're running a 'buy one get one 60% off' promotion at Banana Republic (download the free applications at GetClip.ca to redeem). It seems big businesses like Banana Republic are eager to get in the location-based game too. There's even a Toronto-based Location-Based Marketing Association launching on October 14th. But while these companies are the trend in 2010, the question remains whether the momentum will last. And more importantly, will consumers continue to embrace the applications, or will check-in fatigue set in? If the startups mentioned above have their way, this is just the beginning of the craze - and they're betting that geo-location is where it's at.